Haven’t trained as I would have liked, but I always want to do my best. My main concern is not hurting something like my achilles, perenial tendon, glute or hamstring. The exciting part is Anna running her 1st 10k! And that our friends, Susanne Hartley & Caryn Galekas, are here to run. We all pray together before our races. After we see Robin & Ariel off on their 5k, Anna & I warm-up and stretch. It’s raining slightly and chilly (50 deg) but doing strides gets us breathing hard and loose enough to stretch. This all helps me to prevent injury and Anna to prevent side cramps. Our goals are 6:50 pace & 9:20 pace and we line up at the start accordingly. We pray again. we both know that we will be watched by God and by others and we really want to show our apreciation and thankfulness for them. Anna has a light long sleave under her jersey and I have arm warmers and gloves. Perfect. 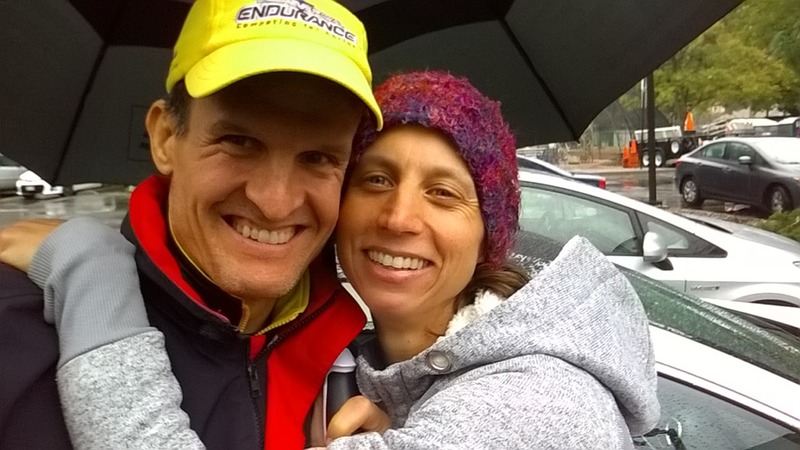 I’m alongside friend, Richard Kane, and we talk about the upcoming triathlon season. Go! Something about a crowd running that makes it feel so easy. I’m focussed on good form, light feet, and not pushing the pace early. I see a young firl about 12 and I wonder if Anna will eventually run with her. It’s going well. Nothing is hurting. We’re on the streets. Rich and I are still together. Mile 1. 6:37. More streets and then onto the park pathways which are great and scenic. Staying with a group. Some high school / college kids. Mile 2. 6:45. Went slower. Feeling surprisingly good, though, so will try to pick it up. Great pathways. Mile 3. 6:40. Great. Getting faster. Running tall. Near the first woman. Pull ahead. Thinking a lot about Anna back there somewhere. Praying it goes well. And thanking the Lord for letting my body feel much better than it should. I want to run well for Him. Mile 4. 6:35. Even better! Heading back now. Tired. Looking forward to 5 miles. Mile 5. 6:25. So great to see negative splits. Only a mile to go. Imagining a mile at our FCA Tuesday Track workouts. Very happy with this run. Hope to break 41. On the long finish stretch now. Can I catch the guy far ahead? Mile 6. 6:13. Terrific. I hear Robin and Ariel cheering. I pass the runner and sprint with all I’ve got. Thank you, Lord, for this race and allowing me to run pain-free. Now I can’t wait to head back and see where Anna is….. Go!!!!!!!!!! And we are off. I start running. Mile 1: 8:18. I see a girl up ahead in a white shirt. I decide to stay up with her even though I will be going under my pace. I follow her and stay up with her. Mile 2: 7:56. Now I see another girl in front of me. I decide to try to pass both of them. I pass them. Mile 3: 7:45. I stay ahead of both of them and keep running. Now I see a boy up ahead. I pass him. Mile 4: 7:40. I keep running and making goals for my self like, “I can't wait till I get to 4 and a half miles”. Now I see that the boy I passed is right behind me. I keep running for a little bit and then he passes me. I say good jod to him and ask how old he was. He says he is 9 years old. I am surprised that a 9 year old is passing me. But it is just my first 10k. Mile 5: 7:44. I keep running and soon I’m on a road and there is a turn-around. So l turn around and then turn again then way ahead is the finish line! Mile 6: 7:54. 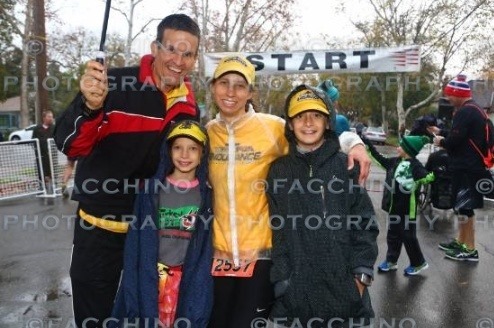 I run and my family cheers me on and I sprint in to the finish. I got first in my age group and got a time of 50 min. I feel thankful and happy at the same time. 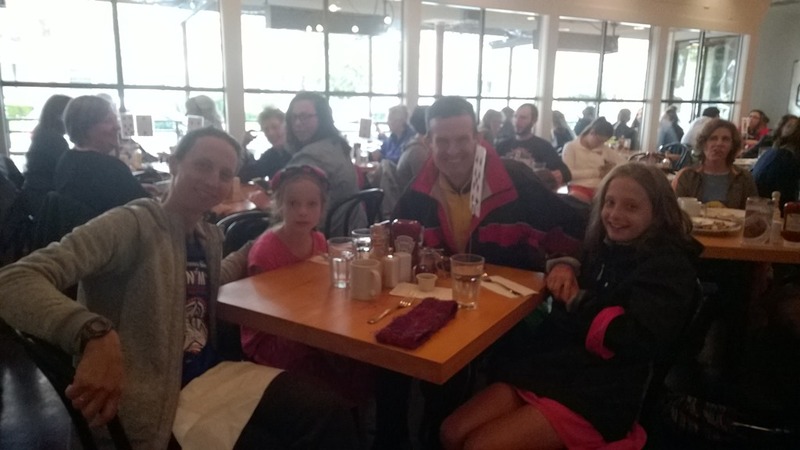 I’m looking forward to the family racing together and having a yummy breakfast after! 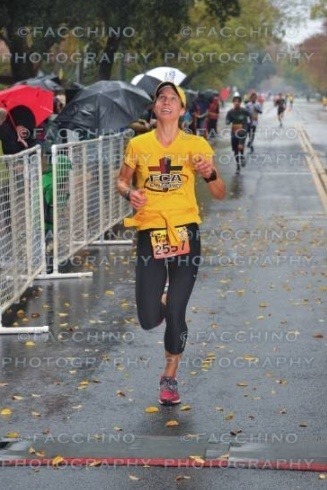 It looks like rain but hard to tell at this race. Ariel and I are doing the 5K and Troy and Anna the 10K. This is Anna’s first 10K! Ariel will run on her own and I’ll finish with her once I cross the line. She was running so fast yesterday when we did a family mile run. She wants to run 30 minutes. I ran 21:24 last year and I’m not expecting to match that. I have been feeling a bit discouraged by my fitness…but it’s my own fault because I’m not putting in the miles. I am very encouraged by my spiritual fitness. I feel a closeness with the Lord and a desire to be an ambassador for Him! We find our FCA teammates Caryn Galeckas and Suzanne Hartley. We all pray together. Nice! Ariel and I line up. Troy gets her in a good, safe spot closer to the back. The 5Kers are starting with the half marathoners. Ready, set, go! We are off. I take off with the 1:30 half marathon pace group. I hope to go under 7 min pace so this is a good place to be! Haven’t been running this kind of pace for more than a mile at the FCA track workouts so it’s risky. I actually feel strong so maybe it will be okay. Mile 1 is 6:41. Nice! Feeling good! I pass the 1:30 group because their pace has dropped off a bit. I run under the ped overpass. No runners there yet so I must be doing okay. I’ll look for Ariel down below once I get up the there. The 1:30 group is with me again but we soon split off. I tell them great job and keep it up! We jump onto a greenbelt and wind our way back to the ped overpass. I look for Ariel’s pink shirt but don’t see her. I call out her name in case she can hear me. Mile 2 is 6:50. Good! Still feeling strong! Thank you Lord! What a gift to be able to push so hard! I run through a park and pass 2 girls. I tell them good job. Soon, I’m back on the street and heading back to the finish. I look at my watch and wonder if I can actually go under 21 min. That would cool! I can see the finish way off. Dig deep! Those other girls are probably not far behind! Mile 3 is 6:37. Pushing hard, smiling and thanking Jesus! 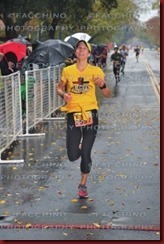 I cross the finish in 21:27. Wow, so close to last year! I’m happy with that! 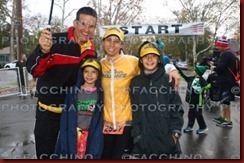 I hug Troy and Anna at the finish and run back for Ariel. Troy and Anna are now off to the start of their race. I find Ariel running really strong. I tell her right when she hits a certain landmark to sprint like she did on her run yesterday. Right on cue, she goes for it! She finishes under 30 minutes! Yeah! Thank You God! Go!!!! I run off. I’m starting to feel behind. I’m sad that Mommy and Daddy aren’t with me. I start to feel better. Then I see the sign for 1 Mile. Mile 1. 9:01. I keep running and I see the bridge that racers cross. I look for Mom but don’t see her. I keep running and make a turn. I see a sign pointing 5Kers right and I follow it onto a trail. I keep following the trail and see that bridge again. I go over the bridge. Mile 2. 9:31. I see the sign for Mile 2 and an Aid Station. I grab a cup of water, drink it and throw it. I keep running and see another 5K sign in a park. I follow the people in front of me. We get back to the road going to the finish line. I see someone in yellow coming towards me and think it is Dad coming for me. But it is Mom. She encourages me all the way to the finish. Mile 3. 9:38. At the very end I sprint super hard. I come into the finish. I finished!!! !